Large Group Dynamics in Quasi-Sacred Organizations: Does homeschooling inform accurate education reform modelling? Does homeschooling inform accurate education reform modelling? The other week I tried to do some armchair speculating about which standard science based evolution of religion model would best fit education. Besides having some idle fun, the goal was to investigate feasibility of an approach to analyzing the physics giving rise to education's (moralistic and ideologically influenced) reform resistant dynamics. Last week I used blended learning as a foil for analysis. This armchair analysis suggested that, in post-secondary contexts, education fit a performance modelled religion (or quasi-religious like group) better than a commitment modelled religion (or quasi-religious like group); A sharing of common experience seems to matter more than whether students avoid "taking the easy road out" through perceptionally easier online alternatives. Extending this method of analysis into K-12 is problematic (for broad-based methodologies). In K-12 contexts, blended learning courses and programs tend to be extremely hybridized (see Cuban's 2013 discussion on Ed's tendency for hybridization & his blog). Few K-12 schools clearly fence off the delivery of online courses. Those that do, tend to either be fully online schools, or engage in much more hybridization than they are likely to admit. The Christensen's institute's Rise of K-12 Blended Learning report (and database) and the Blend My Learning database provide lots of extremely useful information about the blended models K-12 schools employ. Schools which offer true blended programming (fully online courses which are distinct from face-to-face or blended courses) certainly could be used to analyze the religious models best fitting education. However, homeschooling offers another potential foil for analysis. The first way homeschooling can act as investigative foil is with regards to mixed programming between a traditional school and the family. A small, but growing percentage of homeschooling programs (particularly fully funded, curricularly based "distance learning" programs) have agreements with parent school districts and local schools that enable "homeschool" students to take one or more face-to-face courses at their local traditional brick and mortar school. At least in my neck of the woods, bureaucratic rules preclude this for non-curricular based homeschool programs. A comparison of teacher and community perceptions of mixed homeschooling and pure homeschooling has the potential to tease out distinctions between commitment model fit and performance model fit. This could be done using methodology similar to that outlined in the blended learning analysis. Basically, ask people what they think about homeschoolers who take all, most, some or none of their courses in a traditional school. 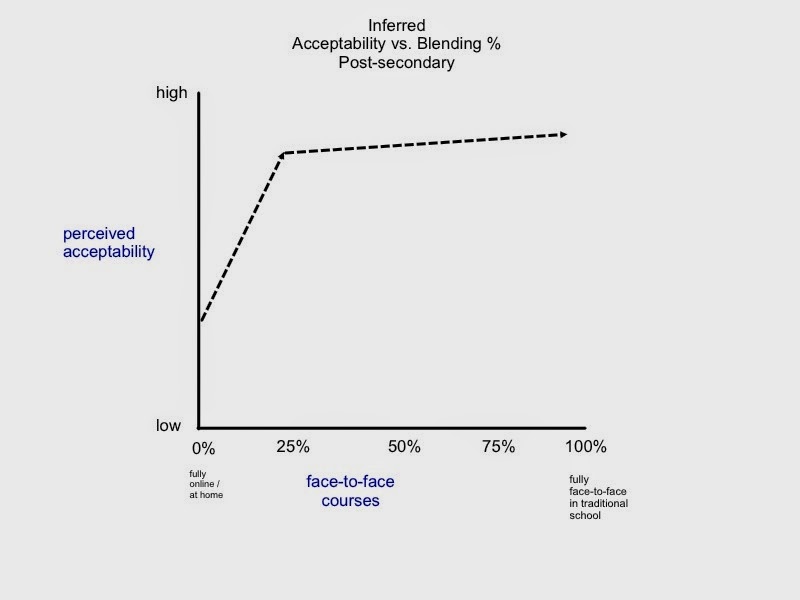 Measure perceived levels of acceptability versus percentage of courses done in a traditional way. My (unfounded) suspicion, based on a handful of experience with such cases, is that one would see a partial linear relation emerge for mixed homeschooling programs. I also suspect a single traditional school course would make a huge difference in "acceptability" (see left graph). This is almost what I theorized might happen in post-secondary. In post-secondary I theorized, after one face-to-face course, there would be little difference in perceived acceptability. In other words, either things would be much less linear during the transition phase or the slope would be much less significant (see images to the left). This may suggest K-12 schooling may have more influence from a commitment model and its hypothesized (though certainly not verified) linear effects. However, this is a pretty big "may" (in fact a pretty big double "may"). Commitment models of religion need not be any more or less linear than a performance model of religion. Both are likely subject to phase change once a minimum input threshold has been met. Unfortunately, I haven't seen any research on curve types. Hence the utter speculation currently involved in such (testable) inquiries. One thing to note from these curves is that near total acceptability in K-12 is likely only to come when all courses are completed in a traditional format. In post-secondary, I doubt very much whether anyone cares if you took some of your electives or even core courses in an online format. That is very much not the case with homeschooling. Experience suggests rejection of traditional school based power structures elicit nasty community judgments. Homeschooling stigma seems to hold whether or not families reject just the structure of schooling or the structure and curriculum. I'd also note that this stigma seems to vanish dramatically when homeschool parents acknowledge the prime positional role of traditional schooling. From my experience in this field, parents suffer minimal stigmatization when they indicate to the community that their reasons for homeschooling are to provide specific special needs attention not available or feasible within traditional schools. This (untested) trend seems fits the power dynamics one expects to see with moralistic based groups (ie. religion, rule of law, strong moral ideologies, etc.). The other way to use homeschooling as a foil for the specific science of religion model fitting education is via direct survey-styled questions. Create a couple of different case studies that highlight various levels of homeschoolers' rejection of 1) commitment to education, 2) intent to share common (educational) experiences, 3) governmental (curricular) power. Stitka's (2005) work suggests measuring moral convictions is possible. A nice paper by Ryan suggests this instrument has been repeated enough to be reasonably valid. I tend to be a bit doubtful that direct questions of moral convictions could yield the information necessary to assess the religious evolutionary model which best fits education. However, I could be wrong. Armchair theorizing exploring the physics associated with education's reform resistance suggests education can be interpreted through the lens of quasi-relgious dynamics. Both blended learning and homeschooling are foils that can be used to analyze the potentially non-rational heuristics people use when judging the acceptability of others' non-traditional schooling choices. My biased armchair analysis suggest non-linear effects may be revealed. Non-linearity raises doubts about ration-choice decision model accuracy in educational reform contexts. My personal familiarity with perceptions of homeschooling suggests perceived commitment levels are more of a factor in k-12 education than shared experiences. However, the science of religion field doesn't have data about the linearity or non-linearity (curve type) of each model as a function of participant degree. While one can assume commitment is a more linear function than performance, this is a big assumption. Power dynamics don't fully delineate religious model fit. Homeschooling's rejection of traditional education could either be a rejection of the power of educational ceremony (common experience) or a rejection of education's commitment power (give in to the 'borg'). My experience and my interpretation of homeschool literature (Olsen, 2008, Green & Hoever-Dempsey, 2007) suggest most homeschoolers reject education's norming (borg) role. A possible caveat is that education's norming role could be loosely interpreted as a 'norming' ceremony. However, this really stretches the 'one-time' connotations associated with ceremony. Therefore my conclusion is that a commitment religious model is the best fit for k-12 education while, from last week, a performance religious model is the best fit for post-secondary education. It is interesting to see that homeschooling stigma levels are significantly greater than distance learning stigma levels despite similar degree of exclusion from the brick and mortar school houses. It is certainly tempting to interpret this difference in terms of power dynamic. It is also tempting to further interpret these power dynamics in terms of proximate (group) causes from multi-level theory. And to me at least, it is hard not to contextualize the multi-level proximate causes in terms of quasi-sacred or lightly transcendental quasi-religious-like dynamics. Cuban, L., Tyack. (1995). Tinkering Toward Utopia: Harvard University Press. Green, C., Hoover-Dempsey. (2007) Why do Parents Homeschool? A Systematic Examination of Parental Involvement. Education and Urban Society, 264-285, 39 (264). Olsen, N. (2008). Understanding Parental Motivation to Home School: A Qualitative Case Study. Unpublished doctoral dissertation, University of Missoula, Missoula Montana. Ryan, T. (2013). No Compromise: Political Consequences of Moralized Attitudes. Paper presented at the 2013 American Political Science Association Meeting. Chicago, Illinois. Skitka, L. J., Bauman, C. W., & Sargis, E. G. (2005). Moral conviction: Another contributor to attitude strength or something more? Journal of Personality and Social Psychology, 88, 895–917.